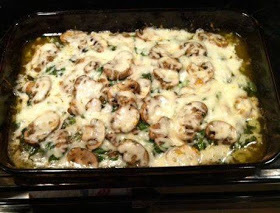 Preheat oven to 375spray a 13/9″ pan with pamput 2 layers of chicken in pan,cover with proscuitto,top with spinach, sprinkle with a little kosher salt and coarse black peppertop with mushroomswhisk together olive oil and savory herb envelopepour over everything.Lay a piece of foil over bake for 35 minutestop with cheese and bake for 9 minutes more. Prepare and bake cake according to package directions, spraying a 13 x 9 inch baking pan with non stick spray. I substituted melted butter in place of the oil called for on the box mix. Allow cake to cool about 20 minutes. Using a large fork poke holes evenly across the entire cake. Mix the orange Jell-O with 1/2 cup boiling water until dissolved. Add 1/2 cup cold water and mix until blended. Pour the orange Jell-O into every other row of fork holes (make sure to use all the gelatin) going back over the initial holes if needed. Mix together the lemon Jell-O with the same amount of water and pour over the remaining holes. Cover cake with plastic wrap and refrigerate cake for 2-4 hours. To prepare the whipped cream frosting, start with a cold bowl. I used my Kitchen aid mixer bowl with the whisk attachment, and placed it in the freezer for about 15 minutes. Remove bowl from freezer and add 2 cups heavy cream and set on medium speed. Add the powdered sugar and the vanilla extract. Whip the cream slowly (this is key and keeps the cream from separating later). Whisk for about 10-15 minutes until the cream begins to ripple (be patient). Turn the mixer off and finish whisking by hand using a wire whisk until the cream starts to thicken and stick to the whisk. Be careful not to whisk to hard or the cream will become clumpy. Spread the whipped cream frosting over the entire cake using an offset spatula.Refrigerate the cake at least 4 hours before serving. 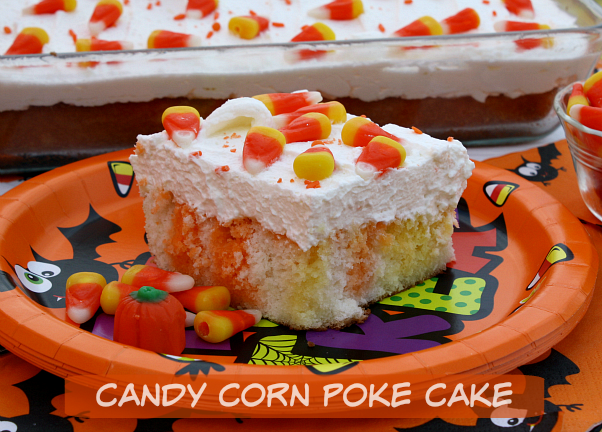 Add the sprinkles and the candy corn candies just before serving. Store any leftovers in the refrigerator.